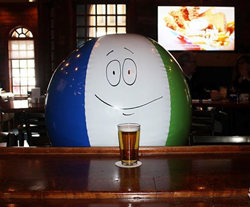 Tourism officials in Traverse City have adopted an amiable beach ball named Moe to play the main role in a new social media marketing plan. The inflatable character is being featured in a series of weekly Facebook posts called “Mondays with Moe,” where he (or she) will be seen enjoying some of the community’s best-known tourist attractions. We wanted to show off some of the unique things about Traverse City in a fun, quirky and very visual way. 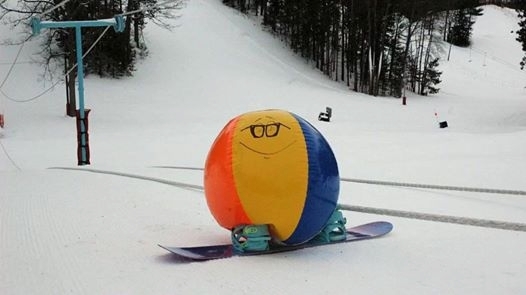 Tourism officials in the Lake Michigan resort community of Traverse City have adopted an amiable beach ball named Moe to play the main role in a new social media marketing plan. Beginning this month, the 30-inch inflatable character is being featured in a series of weekly Facebook posts from Traverse City Tourism called “Mondays with Moe,” in which he (or she) can be seen enjoying some of Traverse City’s best-known tourist attractions – snowboarding down the slopes at Mt. Holiday Ski Area, for instance, or sampling a handcrafted ale at the Blue Tractor Cook Shop. According to Digital Marketing & Design Specialist Coryn Briggs, “Mondays with Moe” is a new campaign to highlight some of the community’s best assets while increasing viewer engagement on social media. Traverse City Tourism’s rotund new ambassador took shape over several weeks of discussions in which several other mascots – including a large cherry and a toy raccoon -- were proposed and discarded. The beach ball, decorated with a cartoon face, is a nod to the community’s fame as a summer beach resort. A full schedule of appearances has been set up for 2015, and the campaign has already created significant interest.